For the third year running, management consulting firm Booz & Co. has named Apple the world's most innovative company in its annual report, Global Innovation 1000 Study: Making Ideas Work. Booz & Co. bases its rankings on an analysis of the "fuzzy front-end" of innovation -- the ability of a company to turn ideas into commercial successes. A direct link to the full report can be found here (pdf) while key findings and methodology are explained here (pdf). 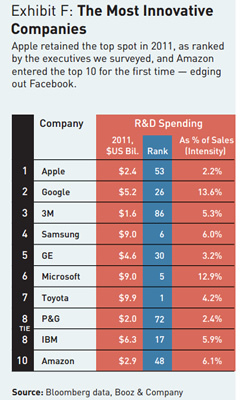 The study analyzes the globe's 1000 largest corporate research and development spenders during 2011. Although Apple spends a sizeable amount on R&D ($2.4 billion), the Cupertino-based company only ranked 54th in terms of annual research spending. In fact, one of the report's key findings (and the reports before it) are there is virtually no correlation between budget, innovation and success. Only three of the top 20 spenders were considered top innovators. Overall, pharmaceutical companies, technology companies and auto makers pepper the list of top R&D spenders. Toyota, the highest spender with nearly $10 billion invested in R&D, ranked seventh in overall innovation. Meanwhile, IBM -- a company well-known for its futurist-inspired "blue sky" projects -- weighed in at 17th with $6.3 billion spent. When it comes to innovation, Google retained its number two spot from 2010. 3M also held firmly in place as the third most innovative company of 2011. Other tech companies who made the top 10 include Microsoft, IBM, Amazon and Samsung -- all of which spent more than twice as much on R&D than Apple, despite its standing as the king of innovators. Overall, money handed out for research and development continues to increase steadily, even in the face of widespread economic difficulties. According to the report, 2011 represents the most money ever collectively spent to turn ideas into commercial products and services -- a whopping 10 percent increase to $603 billion over the previous year.